Exclusive Reduced Rates for Network Health Medicare Advantage Plan Members For ticket information, visit networkhealth.com/offers Fox Cities Performing Arts Center - Appleton, Wisconsin THE PLAY THAT GOES WRONG – May 5 at 1 p.m. Tickets on sale now. Offer expires April 22, 2019. Subject to availability. Marcus Center - Milwaukee, Wisconsin GLENN MILLER ORCHESTRA – May 24 at 7:30 p.m. Priority seating. Tickets on sale now. Offer expires May 23, 2019. Subject to availability. ANASTASIA – July 28 at 1 p.m. Priority seating. Tickets on sale now. Offer expires July 19, 2019. Subject to availability. 14	Reminder - Schedule Your Annual Wellness Visit 14	My Doctor Visit Checklist 15	Helping You Control Your Health 16	FEATURE The Real Strength of a Man	20	The Talk: Advance Care Planning – Why It Matters to Have It Now 21	Transition of Care 22 Don’t Let Running to the Bathroom Run Your Life 23 Network Health Makes Decisions Based on Appropriateness of Care BACK COVER Get Social (For Real). ASK NETWORK HEALTH If you have questions about anything you read in this issue of Concierge, call customer service at 800-378-5234 (TTY 800-947-3529) Monday–Friday, 8 a.m. to 8 p.m. You can also learn more at networkhealth.com. 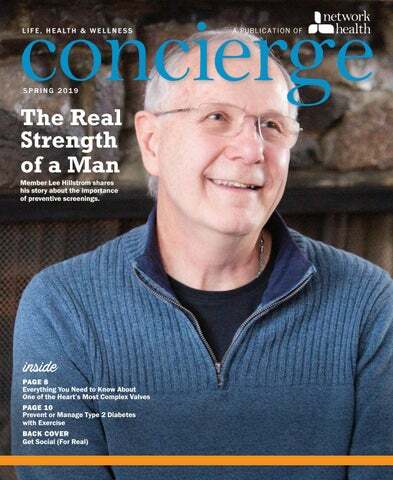 Concierge is a biannual publication of Network Health. The health information contained in Concierge is meant to supplement, not replace, the advice of health care professionals. © 2019 Network Health Insurance Corporation. No portion of this newsletter may be reproduced without written permission from Network Health Insurance Corporation. etwork Healthâ&#x20AC;&#x2122;s mission is to create healthy and strong Wisconsin communities. Top 10 Reasons to Register for the Online Member Portal 10. You want easy access to your plan-specific health care coverage information. to try an online doctor visit, so you don’t even have to leave your home to see a doctor. prefer to send an email, instead of calling. upcoming appointment. You can show your mobile ID card when you check in for your appointment. 5. Your personal doctor has changed, and you need to update your information. 4. Your child or grandchild helped you register. Next time they visit you can show them how much you learned. 3. You want to pay your monthly premium online. Explanation of Benefits (EOBs) online. When you have an EOB available, you’ll receive an email notification. Click your first name in the upper right corner and find this option under My Communication Preferences. Visit login.networkhealth.com today to get started. Lingering plaque can cause gingivitis, which ou may have dental concerns that can’t be causes your gums to become red, swollen and to bleed. resolved by just brushing, flossing and regular cleanings at your dentist’s office. Many common dental Keep your dentures clean and free of food health issues arise later in life, such as dry mouth, gum particles. Have your dentist show you how to disease or dentures. clean and wear them properly. When you go to Always maintain good dental care to keep your teeth sleep, remove your dentures and put them in water and gums healthy, no matter what concerns you have. or a denture-cleaning liquid. If you experience dry mouth, take frequent sips of water and limit your intake of alcohol, caffeine, carbonated drinks and tobacco. Sugar-free gum or sugar-free hard candy can be helpful. It’s important to rinse away food particles from your teeth to avoid the risk of developing tooth decay. Be sure to mention any issues to your dentist. The key to preventing gum disease is to brush and floss regularly to remove plaque from your teeth. In addition to the suggestions above, it is important to keep up your healthy habits. Brush your teeth gently at least twice a day and floss daily. Drink fluoridated water and use fluoride toothpaste. Eat a balanced diet. Avoid tobacco. Have regular dental checkups and cleanings. Member Guide includes a Preventive Health Checklist in the back pocket to assist you with keeping track of which services you have had and which you still need. You’ll find commonly recommended preventive services, categorized and grouped by medical issue. Your personal doctor may recommend additional exams or tests, or a different frequency than the general recommendations. Take the checklist to your appointments to discuss next steps with your personal doctor to ensure you are taking advantage of all the preventive services available to you. ou hear about Network Health nurses helping our members with complex conditions, but did you know we have health coaches to help you quit smoking, stay up-to-date with preventive screenings and even lose weight? The first step is to complete your health risk assessment. You can find your health risk assessment in your online member portal. Visit login.networkhealth.com and log in. Click on the My Wellness tab, then select My Health Questionnaire in the drop-down menu. Hello, I’m Sam. I provide one-on-one support to help members achieve their health and wellness goals. During each coaching session, I offer members encouragement and guidance for maintaining a healthy lifestyle. Sometimes this means identifying current obstacles to a health goal and discussing healthy approaches to overcoming them. In my spare time, I enjoy running, playing softball, exploring the outdoors and spending time with my husband and puppy. When I am not playing sports, you might hear me cheering for the Packers or one of our other Wisconsin-based sports teams. Sam graduated from Lakeland College with a bachelor’s degree in exercise science and sports studies. Hello, I’m Jennifer. I build relationships with members to help them use their personal strengths to meet their individual health goals. I show members how they can improve their longevity and quality of life with targeted behavior changes and healthy lifestyle choices. In my spare time, I enjoy many outdoor activities, including jogging, kayaking and fishing. I also spend time planting and harvesting produce from my garden. I enjoy playing cards or board games, and I like working on arts and crafts projects. My sweet weakness is dark chocolate. 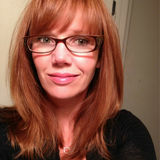 Jennifer holds a bachelor’s degree in health promotion and wellness with a minor in psychology from the University of Wisconsin-Stevens Point. To learn more about health coaching, please call 800-378-5234 (TTY 800-947-3529), Monday–Friday from 8 a.m. to 4 p.m.
A Focus on Quality Health Care By Lisa Boucher, BS, accreditation program manager for Network Health At Network Health, our commitment to quality isn’t about awards, ratings or accreditations. We will continue to exceed the industry’s high standards because we put the spotlight on you. Our quality department focuses on improving the health care services you receive every day and ensuring your experience with Network Health surpasses your expectations. Our quality programs concentrate on the following. Delivering high-quality, safe and cost-effective health care and collaborating with our provider-owners. The heart has four valves, the one most commonly affected is the mitral valve. The mitral valve is located between the left atrium and the left ventricle; it opens to allow blood to flow from the atrium to the ventricle and then closes when the ventricle contracts to send blood to the body. Narrowing of the mitral valve. Enlarging or bulging of one or both valve’s leaflets, allowing a small amount of blood to flow back into the atrium. Incomplete closing of the valve’s leaflets due to hereditary causes or disease. Severe cases can lead to heart failure. When the mitral valve malfunctions, it places extra strain on the heart and lungs. Sophisticated diagnostic imaging, such as an echocardiogram (commonly called an echo), can pinpoint trouble. The noninvasive test evaluates heart and valve function by using sound waves. “Treatment options for mitral valve disease include an open, traditional procedure; medicine alone; and, increasingly, minimally invasive procedures through an artery or a vein, often referred to as transcatheter procedures,” said Michael Salinger, MD, a Froedtert & MCW interventional cardiologist. The type of treatment is based primarily on the person’s age but is tailored to the individual. When possible, surgeons prefer to repair the valve by rebuilding its chords and leaflets and tightening the frame around it. If a valve needs to be replaced, surgeons can implant a bioprosthesis valve made of animal tissue or a manufactured valve, typically made from metal. Manufactured valves are the most durable, but can form clots, so recipients must take bloodthinning medication. Tissue valves generally do not require blood thinners but eventually wear out. can help reduce your risk of falling. Balancing on one leg at a time, attending strength and balance group classes, doing yoga and stretching are great exercises to incorporate into your daily routine. Tools are available online at networkhealth.com to find a pharmacy and look up medications. by the time I was ready to go pick it up, I had a text from my pharmacy saying it was ready. MDLIVE was very convenient, easy and cost-effective. I will use it again if I need care and can’t get to my personal doctor. Is It a Routine Eye Exam or a Medical Eye Exam? $999,999.99 $99,999.99 $999,999.99 the plan providing coverage. 12 The amount of money you pay before Network Health begins paying for services. 13 The amount that Network Health paid your doctor. The date the claim was processed. Benefit Accumulator for Plan Year starting 01/01/9999 an explanation code. Details can be found on Plan Limit Applied This isRemaining 14 The date the service was provided. the last page of your EOB. Breaks down your share of the original bill. A fixed fee you pay for services. A code the provider uses to indicate the reason for Page 2 the service. 16 A brief description of the service you received. his is a great time of the year to schedule your 2019 annual wellness visit with your personal doctor. At this visit, you and your doctor will discuss your health history, medications, preventive screenings and immunizations. Annual wellness visits help you and your doctor understand your health risks and discover any new or developing conditions. Early detection can provide better outcomes, which ultimately saves you money. Because Network Health cares about maintaining and improving your health, the annual wellness visit is considered a preventive service and is covered at no cost to you. Your doctor may offer additional services during the annual wellness visit as a convenience to you, such as reviewing specific medical conditions, refilling medications and discussing concerns you have. It’s a good idea to bring up concerns as early as possible but be aware that these additional services may result in other charges or copayments. To avoid surprises, ask your doctor at the start of the visit what is covered as a wellness visit and what is not. Remember, an office visit copayment is much less expensive than an emergency room visit. My Doctor Visit Checklist It can be difficult to discuss certain topics with your doctor, especially if you’re concerned about costs. It’s important to address concerns as early as possible, because they may be the symptom of a larger issue. Consider this guide for your next visit. I am experiencing the following. Persistent sad or empty feelings, lasting more than two weeks Falling, dizziness or instability Shortness of breath Excessive sweating More frequent bathroom visits Tingling of feet or hands Trouble with medication(s) Loss of or increased appetite Loss of or increased weight If you’re experiencing any of these issues, please share this information with your personal doctor. This can be the first step to feeling better. id you know Network Health offers personal wellness, care management and condition management services at no cost to you? Our health management team is here to help put you in control of your health. Whether youâ&#x20AC;&#x2122;re seeking health advice or dealing with an unexpected health issue, a chronic disease or a complex diagnosis, we can help you manage your health to increase your sense of well-being. Health management begins with a one-on-one phone conversation between you and one of our health coaches, condition managers or care managers. If you choose to participate, your health coach or manager will work with you to meet your health goals. He or she can also assist you with the following. If you need assistance quitting smoking, eating healthier, controlling blood pressure, or learning about easy ways to exercise, our health coaches will support your journey to a healthier life. If you feel you could benefit from health coaching, condition or care management support or would like to learn more about our programs, call 866-709-0019 (TTY 800-947-3529), Mondayâ&#x20AC;&#x201C;Friday from 8 a.m. to 5 p.m. Callers may leave a message 24 hours a day, seven days a week. You can also get more information about our programs by visiting networkhealth.com, select Medicare Plans and choose Wellness Programs. You may opt out of any program at any time by calling your health care concierge team at 800-378-5234 (TTY 800-947-3529). Review your medications and treatment plans. Help you identify signs that your health condition is worsening and understand when to act, including when to contact your personal doctor. Work with your personal doctor to ensure they are aware of changes in your health. Ensure you and/or your caregivers feel included in your health care decisions. Help you maintain or improve your health by setting healthy goals. Help coordinate care with your personal doctor and community services. Answer any questions you may have. If you have diabetes, heart disease, heart failure, chronic obstructive pulmonary disease (COPD) or depression, our condition management team can provide educational resources specific to your diagnosis. You see the mailings that remind you to schedule your preventive screenings. Your doctor talks about the services that help maintain and improve your health. Even if youâ&#x20AC;&#x2122;re healthy, you should take action. Thatâ&#x20AC;&#x2122;s exactly what Network Health Medicare Advantage member Lee Hillstrom did, and it may have saved his life. personal experience brings trust to the people that attend. I understand the fear and emotions cancer brings to men. This can make life difficult for us since we’re supposed to be in control and strong. I have learned that I am not weak by getting help. I share that message and help men understand they are brave and in control by seeking ways to make themselves healthy again. “The mental battle is a huge part of this process. I show people the Balancing Rx Bracelet I got from my counselor. Each color stands for something and helps me focus. It’s important to understand that mental health is another part of the body that needs to supported, not something to fear making you look weak. You have to take care of yourself and not worry about people who don’t walk in your shoes.” The goal of the support group is to offer help and educate members, ranging from those exploring treatment options to those who are in advanced stages of cancer. Some nights they learn from a guest speaker, some nights they learn from each other and other nights they celebrate with food and relaxation. “At our first Christmas party, I noticed one of our older members sitting by himself at a table. I went over and sat down to talk. I asked if he had enough food. He said he did and that it was wonderful. He then took my hands, looked me in the eyes and thanked me for giving him this opportunity. His wife had passed away and he wasn’t sure he would enjoy coming alone. Everything about the evening, including conversations with other attendees, helped him feel happy for a change, even though he was facing some difficult health issues of his own.” Lee’s desire to share his message and his encouragement for people to tell their own stories is the reason that the Fox Cities Chapter is so successful. “I really enjoy speaking privately with the man with cancer and his family members because they are all affected. They have so many questions about what to do, treatment options, and potential side effects. We’ll sit and talk for hours to go over everything. I don’t tell them what to do; I just tell them what I have gone through and what others have gone through. They find comfort in hearing from people with similar experiences.” Lee’s opportunity to support others took another turn last year when Joy learned she had breast cancer. Joy made the decision to have surgery for her cancer and the weekend before her surgery, she ran a half marathon. ational Health Care Decisions Day is April 16. Mark your calendar to share your advance care plan with your family and loved ones. This day exists to educate and empower the public and providers about the importance of advance care planning. You may not have heard of advance care planning, but it affects each of us. It’s a way for you to plan and make decisions now, to guide your health care in the future if you are ever unable to speak for yourself or make your own decisions. Usually, only you can make important decisions about your health. There are situations where you may not be able to do so, such as an accident or illness that causes confusion or affects your ability to communicate your wishes to your health care team. It’s hard to think about that type of situation, but if it were to happen, who would you want to make health decisions for you? And how would that person know what your wishes are? The talk about advance care planning helps prepare your health care providers and the person you choose to make your health care decisions by discussing what is important to you and what you value in life. It allows you to decide the care you want to receive if you become unable to speak for yourself. You can leave instructions that take your values and preferences into account and eliminate uncertainty for your doctors and family members. Advance care planning instructions can give peace of mind to you, your family, and those making important decisions on your behalf. When is the ideal time to have the talk? your wishes. Like a retirement plan, things can change, so you might need to revisit it occasionally and have further discussions with your personal doctor and family. Remember, your advance care plan is only used when you are unable to make your own health care decisions. At that point, your appointed decision maker will reference your wishes, values and beliefs before making health care decisions on your behalf. How is advance care planning different than an advance directive? The two are related, but an advance directive is different than advance care planning. An advance directive is a legal document that becomes effective if you are incapacitated and unable to speak for yourself. Advance directives include the following. A living will – This allows you to specify whether or not you would like to receive emergency treatments, such as CPR, artificial nutrition or hydration, use of ventilators or comfort care, that could be offered if you are dying or permanently unconscious. Durable power of attorney – A durable power of attorney allows you to name a health care proxy—a person who knows your wishes and will make treatment decisions for you if you are unable to do so. Do not resuscitate (DNR) or do not intubate (DNI) orders. We recommend regularly reviewing and updating legal documents. Make sure to discuss any changes with your personal doctor and family. oing home from the hospital can be overwhelming, whether your hospital stay was planned or unplanned. Network Health is here to support you with a smooth transition by making sure your needs are met. This can reduce the chances you’ll return to the hospital. You may have a new diagnosis, treatment or other changes in your health that affect your ability to manage your condition. Since you are the only constant in your health care journey, it’s important for you to have the right tools. oss of bladder control, also known as urinary incontinence, is a common problem. Symptoms may include leaking urine during normal activities or having to go urgently or often. Although you may feel embarrassed about these symptoms, it is important to talk with your doctor about any bladder control issues you experience. Why it’s important to see your doctor if you experience urinary incontinence It may affect your daily activities and prevent you from spending time with family and friends It may prevent you from getting a good night sleep It may increase risk of falls if you are rushing to the bathroom It may indicate a more serious problem Urinary incontinence is a symptom, not a disease. Discussing symptoms and treatment with your doctor and having a thorough evaluation can help determine the cause and may resolve your symptoms. e want you to venture out and explore the real world. Below, you will find a brief highlight of special events in our community. For more outdoor fun, follow Network Health Wisconsin on Facebook. Thursdays Lunchtime Live! Concerts May 30– www.appletondowntown.org/upcoming-events August 29 Thursdays Heid Music Summer Concert Series May 30– www.appletondowntown.org/upcoming-events August 29 June 8 Bellin Run 10k, 5k Walk - www.bellinrun.com June 8 Elkhart Lake Triathlon - www.eklhartlake.com/events/ June 9 HFM Maritime Marathon - www.maritimemarathon.org Saturdays Downtown Appleton Farm Market June 15– www.appletondowntown.org/upcoming-events October 26 Listed events are accurate at the time of printing.